﻿Are you raising a bright and quirky child? Looking for answers in helping your child thrive, even with focus, learning, social, emotional or behavioral challenges? Wanting to find a community of experts and parents who ‘get’ a twice exceptional child who is both bright and struggling? 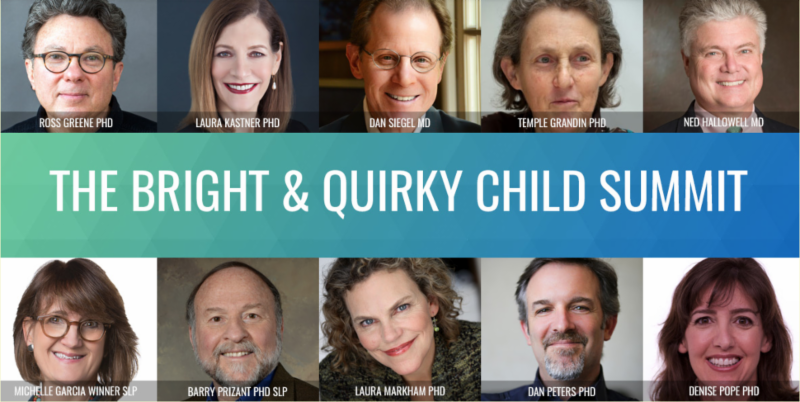 Join Licensed Marriage and Family Therapist Debbie Steinberg Kuntz for The FREE Bright & Quirky Child Online Summit starting January 28, 2019. The 30 speakers include Dr. Ned Hallowell - see below for other experts, presentations and times. Sign up at Bright and Quirky Conference 2019. Talks will be available starting at 7am PDT each day, starting January 28th, at no charge, for 24 hours. Entering Our 14th Year!! Registration is OPEN! Join Dr. Hallowell, Sue, Rob, Marise and fellow families sharing similar trials and successes. Learn how to raise kids who are spirited, sensitive, or strong willed. You’ll get access to inspirational ideas and practical tools to teach kids to handle their feelings, make friends, and do their best. You will be revived, inspired, and empowered with tools to help your family stay connected! Early Bird Special if registered by February 28th! "Unwrapping the Gifts: A Strength-Based Approach to ADHD Across the Life Span." This one-week seminar at the Cape Cod Institute will explore the entire world of ADHD in its human, clinical and scientific dimensions. 3 hours with me (9 - noon) and the rest of the day on the beach, on a sailboat, or curled up with a book. Early Bird Special if registered by March 1st!